Corey wrote: Source of the post The dandelions were full bloom yellow yesterday and today I can't see any from inside the house. They're probably just closed up getting ready to open again with the white feathery seeds that will spread all over. lololol. Corey not knowing dandelions close at night and this morning he thought they all died because he didn't see yellow. Tyler wrote: lololol. Corey not knowing dandelions close at night and this morning he thought they all died because he didn't see yellow. My mind is too full of useful facts to know about that. Corey wrote: My mind is too full of useful facts to know about that. Like the Glee version of pop songs? I don't know if this was talked about in any other thread, but does anyone have recommendations for weedwhacker/weedeater/weed whip/edger? We have a good amount of areas that could use it due to the landscape and edges around the deck and fence. wags83 wrote: I don't know if this was talked about in any other thread, but does anyone have recommendations for weedwhacker/weedeater/weed whip/edger? We have a good amount of areas that could use it due to the landscape and edges around the deck and fence. I have a 40v black & Decker trimmer. It gets the job done just fine. Depending on the size of your yard, you could probably get away with a 20v. I'm able to trim and blow my yard on one charge no problem. The package I bought included a trimmer, blower, and one battery. I'm sure you'll be fine with any brand battery powered if you don't have too big of a yard. Otherwise you'd need another battery or gas powered tools. I bought the 20v Black and Decker weed eater last year for under $50. Perfect for 10 minutes I need it for. It can do the edging towards the front of the charge. I have a 20v (I think) Black and Decker Wacker. Perfect for the 10 minutes I need. I have seen the Black&Decker combo pack on sale a lot recently with weed whip and blower. I don't usually hear good things about B&D but maybe it's worth it for what I need. The biggest issue is the fence and under the deck so there is a good amount of space that I need it for, but maybe one of the larger battery options would work. I have the below. It works more than well enough for my needs. I got it for $50 on sale in March. The b&d weed whacker is fine I am able to do my whole yard with the 40 volt. The blower that comes with the combo pack is the worst blower in the world. bmyoungs wrote: The b&d weed whacker is fine I am able to do my whole yard with the 40 volt. The blower that comes with the combo pack is the worst blower in the world. I can't say if it's the worst in the world, but I'll agree that it's not great. I place more if of the blame on the battery than the tool itself but to each his own. I'll pick it up tonight. It's nice having all tools in the same ecosystem, but isn't a big deal if your Wacker takes a different battery than the rest. I think I'm giving up on my lawn. In my front yard, I raked the acorns out of my grass for probably an hour and only finished a 2x2 foot patch. In that time, I filled up 3 buckets of acorns, and the yard looked no different. I have the B&D trimmer with the 40 Max battery, and ive never seen an issue. I can use it for 2 hours, no problem. I have a different blower though. cwilkins88 wrote: I think I'm giving up on my lawn. In my front yard, I raked the acorns out of my grass for probably an hour and only finished a 2x2 foot patch. In that time, I filled up 3 buckets of acorns, and the yard looked no different. Yeah I guess I've never thought of how to manage acorns. I've seen yards that have them and it just seems like they're always everywhere. 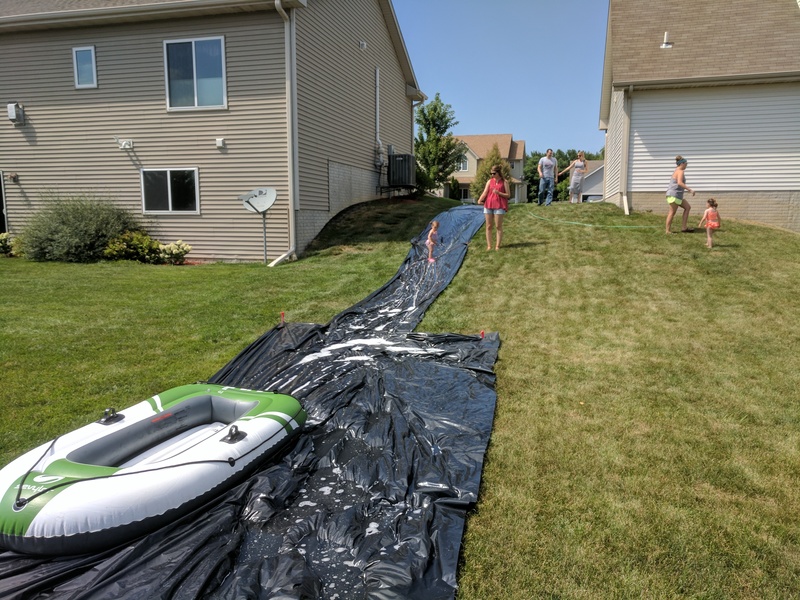 I made a 75 foot slip-n-slide over the weekend. I was worried all the detergent we had to use as lubricant would hurt the grass, but it turns out the tarp itself was the most damaging. The top 2/3rds seems to be fine, but at the bottom I had the biggest tarp and that is the problem area now. I think that area didn't get as much water to keep the tarp cool so it just fried the grass underneath. What's weird is that part was covered the least amount of time too. Someone put their leg through the tarp right at the top so we moved the bottom up there to fix it. Internet says the grass will eventually come back. I will try watering it a lot in the meantime. A lot of this was in the neighbor's yard, but I think most of the damage is in mine. I'll get pictures later today. And yes, I got permission from my neighbors first. 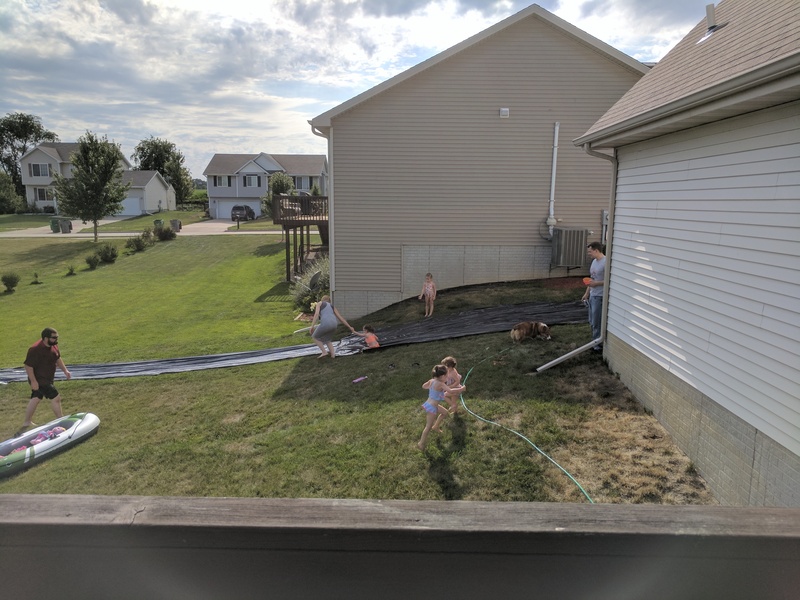 Because of the natural tilt of the lawn it made the most sense to have the tarp right down the property line.